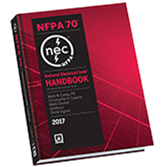 Success in the electrical industry depends on your grasp of NFPA 70®, National Electrical Code® requirements and your ability to apply them correctly. Based on the 2017 NEC, the NEC Handbook clarifies concepts for a better understanding of the Code. It's a powerful communication tool that helps you explain the NEC to clients and others who might not have professional electrical training. As Code changes impact your work, the Handbook brings you up-to-speed with in-text highlighting that indicates where NEC requirements changed from the previous edition, and bullets that signal deletions. Commentary and examples are printed in blue. There's also a complete NFPA 70, NEC Code Index. The 2014 National Electrical Code® Handbook from NFPA® explains today's NEC® in full. There's nothing else like it! The 2014 NEC Handbook is loaded with essential information about Code application, from the experts who know the NEC best. Revised NEC text is highlighted in yellow to make Code changes stand out. Commentary and examples are printed in blue. Vertical rules alert you to new articles, figures, and tables; and bullets signal deletions. Insightful, comprehensive, and dependable, no other source compares with the 2014 NEC Handbook!